Growing up in a talented and creative family, Jamie was encouraged to express her artistic tendencies in paint and sculpture. She continued to explore new media while earning a Bachelor of Science in Animal Science. Jamie’s teaching career started serendipitously during an internship in the exhibits department at the Kansas City Museum. She was drafted to develop and teach history and nature classes to preschoolers. More recently, she spent 11 years teaching life sciences in the public schools. 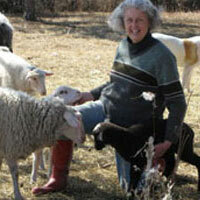 A single lamb purchased in 1991 for these classes began a new passion. Wool from her flock of sheep is the material of her art now. Jamie loves spinning yarn and all forms of felt. She is a member of the Fiber Guild of Greater Kansas City and a known fiber art enabler.